Since the stupendous success of the original deck-building game Dominion, all sorts of something-building games hit the market. Many more deck-building games, of course, but also dice-building games where you add dice to role to your pool and bag-building games where you add pretty much whatever to a bag from where you subsequently draw it. Orleans by Reiner Stockhausen and dlp games, the third nominee for this year’s Kennerspiel award, is not the founder of that last sub-genre, but it is nominated for one of the most prestigious boardgame awards on Earth, so it has to have something special in the bag. That something special is not the setting: players compete to be the most successful ruler in medieval France. I don’t dislike it, but it’s not all that original. Becoming the most successful ruler is not something you can do on your own, you obviously need followers to rule over, followers to work for you, followers to keep in the dark until you need them. You guessed it, followers are what you build your bag with. You start with four of them, a Farmer, a Boatsman, a Craftsman and a Trader. You also start the game drawing four followers per round from your bag, so to start with you might as well not bother putting them in. Followers drawn first go to the Market on your player board, it simply acts as follower storage until you send them out to do something useful. From the market, you assign your Followers to different places where they can do some work. All places are also on your player board, so you never compete for them with your opponents. Don’t worry, there’ll be other things to compete for. The Places being on your Player Board also means that assigning followers, the longest phase of every round, can mostly be done by all players at the same time. Sometimes, a player may insist do finish planning in turn order to make sure his plans are not messed up by the players before, but mostly simultaneous planning works. Assigning followers is as simple as placing follower chips on a matching spot on your player board. All Places have two or three spots, and only when all spots are filled with a follower of the right type will you be able to activate it. If you have followers you can’t use this round, you may either leave them in the market or already put them in a Place, they’ll stay there until you’re ready to activate it. When everyone is done planning, players take turns activating their Places. Most Places have dual benefits: they recruit a new Follower and advance you on the associated track on the main board, awarding some other bonus for it. 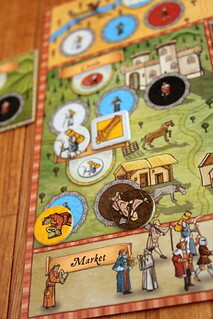 Using the Farm House, for instance, recruits a new Farmer and advances you on the Farm track, letting you take a goods tile: cheap grain at first, but if you advance more often you may take cheese, wine, wool and the very valuable cloth. Cheap and valuable, in this context, means victory points: one brocade tile is worth five victory points, a grain tile only one. The Farmer you just recruited goes in the bag, together with the Followers used to activate the Farm House. By the way, don’t wonder why you need a Boatsman and a Craftsman to activate the Farm House, there is no thematic explanation and mechanically it just works. The next Place, the Village, is special in that you can choose between three different Followers to recruit here. Recruiting a Boatsman here also advances you on the Boatsman track where you receive increasing amounts of money. Recruiting a Craftsman gives you access to Technology: you receive a cog-shaped Technology Tile that can permanently cover a Follower Spot on your player board. His job has been automated, you don’t need to fill that spot any more to activate the Place it belongs to. You can only put one cog per Place, though; no fully automated Farm Houses in the Middle Ages! 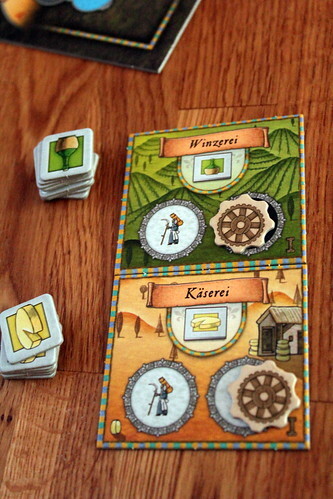 Recruiting a new Trader lets you build one additional Place from the deck of Place Tiles. These tiles go next to your player board and can be activated like other Places, but they are exclusive to you. Some of these Places produce goods for you, others produce Tech Tiles or protect you from events like the Plague, or Taxes. Having one or two that go with your strategy is generally very helpful, but it’s often not worth it to build more. At the University you recruit Scholars, the first type of Follower you don’t have from the start. Activating the University also advances your marker on the Development Track; this track acts as a multiplier for some of your victory points, and we all know that multiplying your points is better than just adding to them. At the castle, you recruit Knights. They are important to protect your Traders on the road and advancing on the Knight Track lets you draw more Followers from your bag every round. As the game progresses, you will want some Knights just for that benefit, drawing four Followers when everyone else takes six or seven is a bit frustrating. Knights can go on the road or river with your Merchant to collect goods. The Ship and Wagon allow you to move your meerchple – that’s a merchant meeple, because this game has one meeple per player, yay! – along a river or road on the map of France, the hitherto unmentioned other half of the main board. Traveling a route on the map lets you pick up one of the the Goods Tiles there for delicious victory points. Even better, you can build Trading Stations in the cities you visit this way using yet another place, the Guildhall. Trading Stations are great because they are one of the things multiplied by your position on the Development Track. They are also one thing where competition with the other player can get harsh because each city can only have one Trading Station. Pushing another player in a corner, forcing him to move through places where he can’t build, makes him waste valuable time. Monks – what can’t they do? The last type of Follower you can recruit are Monks. Going to the Monastery does not have an associated track on the board, no side benefit, all you get is a Monk. But that’s pretty good on its own because Monks are wild cards, they can fill in for any Follower on your player board, eliminating some luck of the draw for you. The luck of the draw is obviously a problem in a game like Orleans. You keep recruiting Followers, often even Followers you didn’t really want to recruit but that you had to take to gain the benefit of advancing on their tracks. You keep adding people to your bag, reducing the chance to draw the ones you really need. If you have six farmers and only one Knight, it’s pretty much your own fault if you don’t draw a Knight. That’s why bag management is a big deal, you pretty much only want followers in there that actually work for you. You have two options to make that happen. If you just don’t want to draw a Follower for a while, simply park him in a Place you’re not going to use soon. For a more permanent solution – you’re really not going to ever need six Farmers – you can send your followers away to work for the greater good and participate in Beneficial Deeds, like building a sewer system, negotiating a peace contract or electing the pope. Those are very different things, but they all work the same: you send followers to the Town Hall on your player board, when you activate them they go to a spot matching their type on the Beneficial Deeds board. That gets them out of your hair and rewards you with a bit of money for each of them. 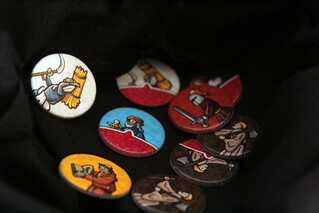 That makes managing your bag comparatively easy.Unlike most thing-building games, where taking something out of your deck/bag/dice pool to make it perform well is difficult, Orleans simply lets you take out two Followers every round and pays you for it. It’s obviously not that easy. Oh, getting rid of Followers is, but the decision whether you should isn’t. The supply for each type of Follower is very limited, and when it’s over it’s over. So if you send too many Farmers to build sewers, and later realize you need a few more, that’s tough luck, there’s no way of getting them back. You also cannot activate a location any more if you’re already at the end of the associated track or if the bonus from that track isn’t available any more. Your bag of followers in Orleans is more dynamic than in most similar games, Followers go in and out of your bag a lot, and keeping it with the right filling is a big challenge of the game. So far, Orleans sounds like a solo game you play at the same time as your friends. You manage your bag, you plan on your player board, where do the other players come in? It doesn’t have the type of interaction where you trade and negotiate, but all players do compete for very scarce resources: Followers, Goods, Technology Tiles, all of them are limited and if an action would make you take something that is over, you cannot take the whole action. That means if the Technology Tiles are over, then you cannot recruit new Craftsmen, even if there are still Craftsmen left: advancing on the Track would give you a Tech Tile, you cannot take a Tech Tile, so you cannot take the action. You could prevented people from advancing on the Farmer Track by getting all the wine from the supply. You also compete for goods on the roads and rivers, you compete for cities to build your Trading Stations in and you compete for the Citizen tiles. You get those for being first on certain spaces of the tracks and for completing Beneficial Deeds, and just like Trading Stations the citizens are multiplied by your position on the Development Track, so they are fervently fought over. The player interaction is there, and if you don’t adapt your strategy to what the other players are doing, you’re going to have a hard time. That’s why, sometimes, you have to insist on planning in player order: you don’t want to use the University if you know someone else can take the last Scholar first. But fortunately, there are plenty of routes to go to score big. Sure, Trading Stations and Citizens sound great because they get multiplied, but you can win just as well by collecting goods or possibly even by collecting enough money, although I haven’t seen that happen yet. All that is why Orleans is my personal pick for Kennerspiel this year, it has everything I’m looking for. It has lots of decisions to make, and every single one of them has an impact. It has very little downtime thanks to all players planning at the same time. It has much more player interaction than it looks at first, although it’s all indirect. It does require a certain amount of luck, because that’s the spice of all something-building games, but it also gives the tools to manage that luck by putting Followers into the bag or taking them out. And although there are many different things to do and strategies to explore, Orleans is very easy to learn because it’s very consistent: once you understand how to activate a Place, you basically understood the whole game. After the first round, none of our test players had any trouble with the rules. Coming up with a winning strategy is not quite as easy. Those are many special things, and Orleans has them all in the bag. 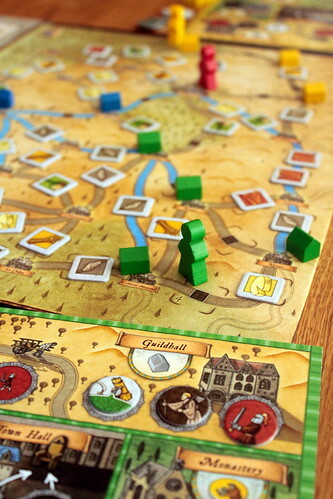 I don’t have any qualms about saying: Orleans is one of the best games I played this year. Previous Post:Meople News: SPACE VIKINGS – did I really not use that title before?